Cellulosic biofuels, also called "second generation" or "advanced" biofuels, are derived from organic plant material (such as wood, grasses, corn stover, wheat straw, etc.) and also from dirtier feedstocks such as tires,1 telephone poles,2 sewage sludge,3 and municipal solid waste (trash).4 As the problems with corn ethanol have become increasingly evident, hopes have shifted to cellulosic fuels. Huge investments in research and development are being made, and the Obama administration has indicated strong support. Plant matter is comprised of cellulose and hemicellulose, which are essentially sugars, and the structural material, lignin. Plants evolved to protect themselves from being consumed, and so the sugars they contain are not easily accessible. Deriving fuels from these materials is thus a complex, energy intensive process.5,6,7 Most conversion technologies depend on thermal gasification (high temperature and pressure), acid hydrolysis, or enzymes to break down material and access the sugars within. Biorefineries require massive and continuous supply of feedstock to maintain operations. These must be accessible within a short distance to avoid transportation costs and emissions.13 The most effective way to provide such a feedstock supply is to use purpose-grown energy crops (industrial monocultures). While some companies claim they will rely on "wastes and residues," the reality is that continual removal of agricultural or forestry residues severely deplete soils and results in erosion. 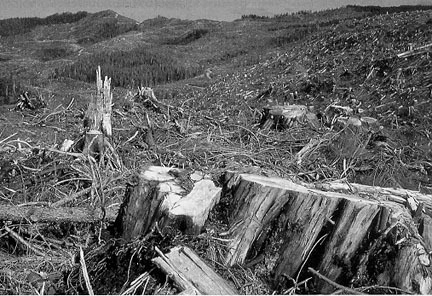 Competition for forestry residues is already intense, with prices rising.14 Industry lobbyists are now pushing to open public and private forested lands for "biomass removal," even as there is increasing recognition of the critical role forests play in regulating the climate. Many facilities are likely to switch to using cheaper (but much dirtier) feedstocks such as construction/demolition wood waste (often treated with toxic chemicals), trash or sewage sludge. In fact, most proposed cellulosic ethanol plants are for trash and sludge. Jatropha has been declared a 'wonder plant' for biodiesel (made from oils, not cellulose). It has been very widely promoted on the basis that it can be grown in arid soil producing seeds with up to 40% oil content. In India, over 14 million hectares of jatropha have been planted with the expectation of such yields. Yet farmers are finding that yields are highly variable and directly correlated with soil fertility and water availability.30,31 Being invasive and toxic, farmers are left with the nasty consequences of poor advice. No life cycle assessment can accurately measure "indirect land use changes" that can occur when large shifts in land use ripple throughout a global system of production and trade.33 For example, when demand for corn for ethanol in the U.S. rose, farmers switched from soy to corn. Unmet demand for soy was met by increasing soy production in Brazil, which was only achieved by clearing more forested land, resulting in a series of connections linking corn ethanol to deforestation emissions. The fact that cellulosic ethanol is still being promoted and subsidized in spite of the false claims is testimony to the power of lobbyists and a major "greenwash" campaign on the part of the agribusiness, forestry, biotechnology, and auto industries. Given extreme soil and water depletion, loss of biodiversity, and an expanding population to feed, does it make sense to add an enormous new demand for plant-based energy? Cellulosic fuels are only part of the expanding demand. The trend toward a "bioeconomy" seeks to replace a large part of fossil fuel energy with plant-based energy, including electricity, heat, chemicals, materials and industrial energy. This scale of demand cannot be met while maintaining a habitable planet. Resistance to GE crops has been strong in Europe, Africa and elsewhere, based largely on health concerns about eating GE foods. Since fuel crops aren't intended as food, the biotech industry is seizing on this back door entry to their markets. "Estimating Water Quality, Air Quality and Soil Carbon Benefits of the Conservation Reserve Program", FAPRI, College of Agriculture, Food and Natural Resources, January 2007. A emission equivalent of 15 million cars on the road if CRP lands of only 3 states were converted to biofuel production according to the article "Carbon, Conservation Reserve Program and Native Prairie." Ducks Unlimited. April 2008. Maddox, T., Priatna, D., Gemita, E. & Salampessy, A. (2007) The conservation of tigers and other wildlife in oil palm plantations. Jambi Province, Sumatra, Indonesia. ZSL Conservation Report No. 7. The Zoological Society of London, London. Expansion of soya in Latin America has displaced hundreds of thousands, as has cane expansion in Brazil and oil palm expansion in Asia and Latin America. In Columbia and Indonesia people have been removed violently. Synthetic Biology being particularly dangerous as they are completely human-made with no natural foundation. Agrofuels: Towards a reality check in nine key areas, pp. 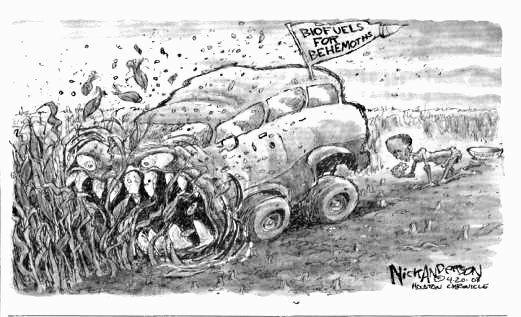 14-15; Nicholas Wade, “Scientists Transplant Genome of Bacteria,” New York Times, June 29, 2007. Idaho National Engineering and Environmental Laboratory, Idaho Falls, ID. "Selective Harvest of Higher Value Wheat Straw Components," study reveals corrosion to the boilers from chlorine present in the biomass. Relevant study on switchgrass biomass by, NREL. Chariton Valley Biomass Project in Iowa. 2001. And, Shell, Iogen Form Cellulosic Ethanol Development Alliance.